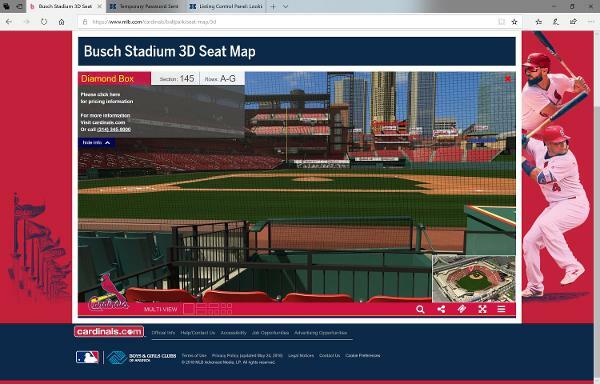 This split ticket opportunity for amazing cardinals experience at every game. Price could vary based on games desired. Cost listed is average price. I will want to have conversation in person to ensure prospective cardinals fan is compatible with our season ticket sharing group. Want Access to the best seats in the house! I live in Northern Illinois. I have submitted an offer, but I cannot meet until March 25th. That is when I will be in St Louis area. So I can most likely pay on thec25th as well. I cannot meet March 20th or earlier. No worries. I can mail to you if it does not work out. You can pay via PayPal or send a check. What is the price per ticket if you were to take all 27 games you have available? I would want 2 for each game i received. Is that possible? I think that the price is a fair price. Would you be using the tickets personally or would you be selling or giving to other people? The reason I ask is more based on the control you have over people using the seats. I am just hesitant to commit if the tickets will just be randomly going to anyone? If I get a good feel for this fact then I am work a little discount into the ticket pricing. Sure thing, This profile request was more for a entity that was sharing more games not just isolated game or two. Happy to have a call with you vs in person. I can mail or just transfer the tickets electronically to an email address and you can print on your side or his. What games are available for your group? We would be interested in sharing seats for the right games. Before the season we have a game selection meeting or conference call. Everyone in the group gets a fair shot at all the games other than opening day. I have two others that share the entire season. Currently I keep 46 games and they have 15 and 20 games. We have an order we rotate as to who picks first each year. As mentioned in the post I have up to 27 games available.